There are hundreds of reasons to love San Francisco. 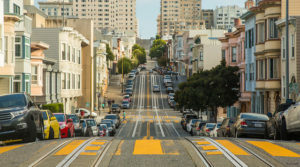 Even though as San Francisco oral surgeons we spend most of our working day in the office, we love to get out and about in the city as often as we can. One of our all-time favorites is the Conservatory of Flowers in Golden Gate Park. It opened to the public in 1879 and has drawn visitors from across the country and across the world to view its’ amazing tropical wonderland. While we are in Golden Gate Park, we like to stop off at the Japanese Tea Garden, especially on a Saturday when you can also go paddle boating on Stow Lake, wander through the Dutch windmills and tulip gardens, or just have a round of golf on the Golden Gate Park golf course. Then there’s the Dolphin Swim and Boat Club. When it started life in 1877 it had a limit of 25 members, but today there are nearly 1,500. Anyone can join and go swimming and rowing, and also take part in the big swims to Alcatraz Island and the Golden Gate Bridge. We also love Sunday Streets where a popular neighborhood street is shut down to traffic in a different area every Sunday. It’s a great way to go walkabout, as the Australians say, and see how the other half lives. We love the magical view of the city on the J train when it pops its head out of the corridor from Noe Valley on to the southwest corner of Dolores Park. A sight to behold, and it almost makes the dreaded commute worthwhile. The Tuesday noon siren. One of the few cities with an emergency broadcast system, San Francisco broadcasts the test every Tuesday at noon through a total of 109 sirens throughout the city. We locals are used to it, but it can certainly scare unwary visitors. More reasons why we love San Francisco include the flocks of wild parrots. These days you can see them just about anywhere, and they are the unofficial bird of the city. Wandering around the Castro is another great way to spend an hour or three. There’s ZGO Perfumery and Apothecary, Harvey Milk’s camera shop, the Rainbow Walk of Fame, and the Castro Country Club – but don’t expect a beer, it’s for teetotalers only. If you want a beer, try Specs, when you can lose yourself afterwards in the delights of the tons of books on the shelves of City Lights just over the road. Chinatown. It’s the oldest Chinatown in North America, and it is also the largest Chinese community outside Asia. Wander down Grant Avenue with the tourist shops and the dragons on the street lamps, and explore all the little alleys and byways. Those are just some of the reasons why we love San Francisco. There are plenty more as well.